If you experience a lot of snowfall during the winter in your area, you know the struggle of dealing with rock salt in your house. Even though it is helpful on roads and sidewalks, it can cause unsightly stains and residue on the floors in your home. If this issue sounds all too familiar, continue reading to learn the best ways to get a handle on the salt mess! Start by taking preventative measures to keep the salt from coming in contact with your floors in the first place. Place a coarse mat outside the front door and another mat on the inside of the door as well. This will catch a lot of the salt from people’s shoes. A rubber shoe mat can also be helpful to keep people’s shoes on, keeping them off the floor. And don’t be shy about asking people to take their shoes off when they come in! Some salt residue is unavoidable this time of year. Here’s what to do to best clean it up on a variety of flooring types. Start by vacuuming up the larger and more obvious debris. Mix an even amount of white vinegar with hot water, and then pour the mixture into a spray bottle. Spray the impacted area with the mixture and let it sit for approximately five minutes. Dab area with a paper towel and allow it to air dry. Vacuum the area once more when the area is dry. Sweep the larger bits up with a broom. Mix about a ½ cup of white vinegar with a gallon of hot water. Use this mixture to mop up the affected area. Let the area air-dry. The vinegar smell (for any floor surface) will eventually dissipate on its own, but the process can be sped up with a fan or by letting in some fresh air. For wood, a ratio of about 1 cup of white vinegar to every 3 gallons of warm water should be used. Note that this is much more diluted than with other floor types. 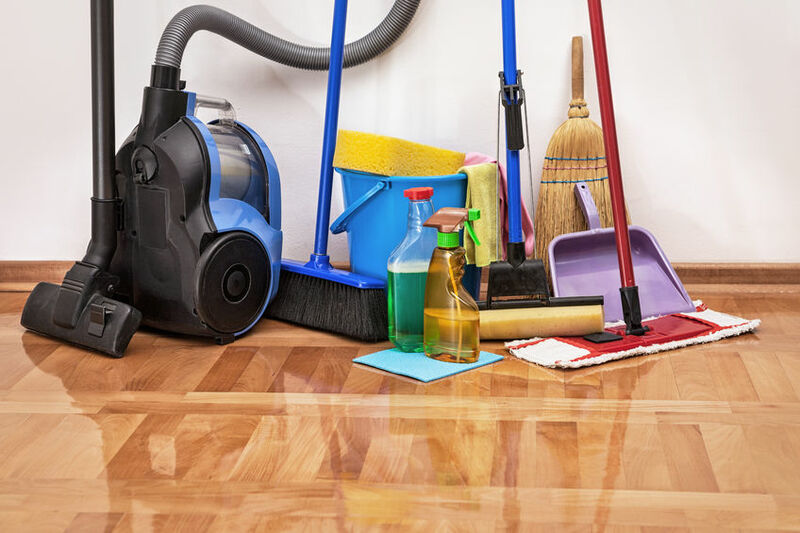 As an alternative, some cleaning solutions that are specifically designed for hardwood floors can be used. Hardwood floors are more sensitive, and you should always check what can and cannot be used on your particular floor, based on the sealant type. You should not use any solutions on an unsealed floor. Use a microfiber mop and your solution to wipe the floor. As with the others, allow it to air dry. Now you should have a salt-free floor! That is, until the next person comes into the house. But at least you have a way to get rid of those unsightly salt marks until spring finally comes around. OEM parts for your major household appliances.